For tranquility and peace of mind, there is no other place better for this purpose than Tranquility Lodge. 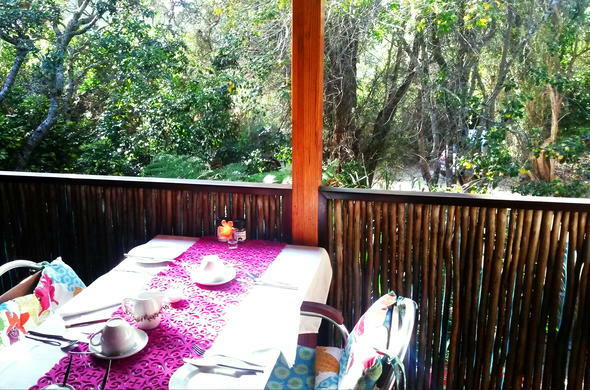 Here at Tranquility Country Lodge you can join in and experience this wonderful place where the ocean and the forests meet in magnificent splendour. Leave the world behind you and let your worries seep away and renew your soul. What makes Nature's Valley special is that it is a haven for nature lovers and outdoor enthusiasts. Spectacular beaches will have you wishing you would never leave. Soak up the sun while watching Dolphins playing in the surf or the breaching Whales celebrating new life. Some of the most magnificent hiking trails with unrivalled views of sea, forest, waterfalls and lagoon will leave you breathless. The Salt River trail is a favourite add-on to the famous Otter Trail (fondly called the 'mini otter'). If you are an early riser, you may be lucky enough to spot the resident family of otters on the beach or scrambling over the rocks. Regular Bush Buck and Bush Pig sightings in the village will enthrall you and there is always the chance of the elusive leopards that hide out in the forest. Nature's Valley is one of the top birding sites for the casual birder or the ardent 'twitcher' with sightings of the Knysna Turaco (Lourie), Narina Trogon, Blackheaded Oriole, African Black Oystercatcher and the ever elusive African Finfoot, just to name a few of the specials in the area. If you love fishing, there is a full range of options from surf and rock to flying fishing in the lagoon with many different species to challenge the intrepid fisherman. On offer from the lodge, there are double kayaks available for exploring the beautiful lagoon estuary whether to go birding, fishing or taking yourself off to some secluded spot for a romantic picnic to soak up the magic of the ancient forest. Regrettably no children under 12 years of age can be accommodated at the lodge.